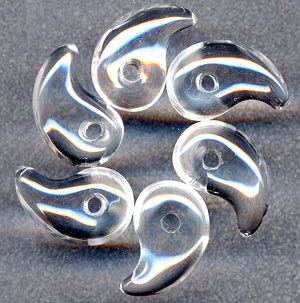 Magatama, are curved beads which first appeared in Japan during the Jomon period. They are mainly made of jade, agate, quartz, and jasper. Some consider them to be an Imperial symbol, It is believed that magatama were popularly worn as jewels for decoration, in addition to their religious meanings. In modern Japan, the magatama's shape of a sphere with a flowing tail is a common visual representation of the human spirit.